A variety of things can damage your teeth, including trauma, disease, decay, and even certain medications. At times, it may be necessary to extract damaged teeth to maintain the overall health of your mouth. At Oral & Facial Surgeons of Arizona, our board-certified oral surgeons perform tooth extractions in the comforting, professional environment of our Phoenix or Tempe offices. Our team has the knowledge and experience to provide our patients an unparalleled quality of care that draws residents of surrounding communities, including Scottsdale, Tempe, and Arcadia. Contact us today to learn more about our procedures or to schedule an examination. Drs. Michael W. Golding and J. Gregory Sabol are board-certified oral and maxillofacial surgeons with decades of highly specialized training and experience. You will meet with one of them during your initial consultation to discuss your treatment options and how the appearance of your mouth can be restored following an extraction. We believe the best patient is an informed patient, so we provide all the education you need to be comfortable with the options you choose throughout every stage of your treatment. To ensure your complete relaxation and a virtually pain-free procedure, our doctors are trained in administering different types of anesthesia, ranging from local anesthesia to general anesthesia, nitrous oxide, and light sedation. Once your mouth is properly numbed, we take a conservative approach during tooth extractions, resulting in less post-procedure discomfort. 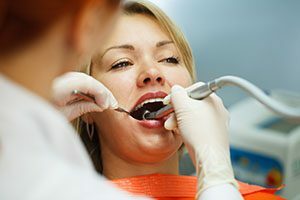 Once your tooth has been removed, you will be instructed to firmly bite on a gauze pad placed over the extraction site. By biting down on gauze for 30 to 45 minutes, it aids the healing of your gums. You may need to repeat this step several times until bleeding stops. Over the next 72 hours following the procedure, patients are advised to refrain from smoking, drinking alcohol, or sipping beverages through a straw to promote healing and avoid dislodging the clot. When you learn that you must have one or more teeth removed to preserve your oral health, it’s important to realize that missing teeth not only take a toll on your appearance, but also on your jawbone and surrounding teeth. Your oral surgeon may recommend a reconstructive procedure to prevent the breakdown and absorption of the jawbone, which can alter your speech, chewing ability, and eventually your facial appearance. Our Phoenix and Tempe offices offer a comprehensive range of reconstructive options to replace one or more missing teeth. Bone grafting – used to strengthen a weakened jawbone and preserve bone quantity and quality. Dental implants – titanium posts embedded into the jaw to mimic natural tooth roots and support crowns, bridges, or dentures. Zygomatic implants– a variation of dental implants designed for patients who have excessive bone loss in the upper jaw. All-On-4® Teeth-in-a-Day – an alternative to a denture that would have to be removed daily. This implant-supported prosthesis does not need daily removal as it utilizes four dental implants on the upper or lower dental arch to support a custom prosthesis for patients missing an entire row of teeth. Oral & Facial Surgeons of Arizona is a practice you can trust with your reconstructive dentistry needs. During a consultation, you can learn more about how these techniques can work together to restore your smile. You can feel confident that your smile is in good hands. Through our board-certified surgeons’ training and expertise, we strive to deliver an unparalleled quality of care. For more information on tooth extractions or the reconstructive dental care provided by our Phoenix or Tempe offices, contact Oral & Facial Surgeons of Arizona today.